Cornell University vs. Columbia University: Which Tech Grads Earn More? College is an investment. If you’re a future tech guru or if you’re about to send your guru off to college, you might be wondering which choice will give you the best return on that investment. Which school will lead to the highest-paying salary? Cornell and Columbia are two excellent choices, and those interested in the tech industry can hone their skills at either one. But which tech grads make the most? Before we look at how tech salaries add up in the years after graduating from Cornell or Columbia, let’s look more closely at some of the other factors that will weigh into your decision. Cornell is a private university, founded in 1865. It is a member of the Ivy League and has seven undergraduate and four graduate and professional schools located in Ithaca, New York. Cornell also has two graduate and professional units in New York City and one in Doha, Qatar. The school’s most recent addition is Cornell Tech in New York City, a “revolutionary model for graduate education that fuses technology with business and creative thinking,” according to the Cornell Tech website. For the 2016-2017 school year, Cornell’s annual tuition and fees were $50,953. Room and board cost $13,950. 46 percent of full-time undergraduates receive need-based financial aid to help cover those costs. The average scholarship or award for freshman is $37,855. Cornell ranked #15 in National Universities in U.S. News and World Report’s 2017 edition of Best Colleges, and #16 in Best Value Schools. Notably, the same list ranked Cornell #9 in best undergraduate engineering programs. The school was also ranked the 16th best university in the world, on Times Higher Education’s 2016-2017 list. The most popular major for 2015 graduates was engineering, with 17 percent of the graduating class. That was followed by Biological and Biomedical Sciences, at 15 percent, and Business, Management, Marketing, and Related Support Services, at 13 percent. Cornell offers almost 80 majors, as well as dual-degree programs and interdisciplinary majors that cross departments. Departments in the College of Engineering include Applied and Engineering Physics, Biological & Environmental Engineering, Computer Science, Electrical & Computer Engineering, Materials Science and Engineering, and Operations Research & Information Engineering. There are 3,342 freshman students currently attending Cornell. Almost 45,000 students applied, and 6,337 were offered admission, making the 2016-2017 year the school’s most selective with a 14.1 percent acceptance rate. The average freshman retention rate is 97 percent. 11.4 percent of the freshman class are international students, 11.3 percent are first-generation students, 44.2 percent identify as students of color, and a record 23.6 percent of the class identify as underrepresented minorities. “Cornell has a way of being as small as you want it to be and as big as you make it.” That’s according to the Cornell website. There are over 1,000 student organizations on campus to choose from, gathering like-minded students with interests in robotics, beekeeping, chess, magic, or animation, to name a few. Cornell has an NCAA Division I athletics program in 37 varsity sports, and hosts over 30 intramural leagues each year. There are also four fitness centers, a bowling center, and two recreational centers. The campus boasts 2300 acres in the Finger Lakes region of New York. There, you’ll find beautiful hiking trails, a nearby lake, and off-campus dining and entertainment. Syracuse is under an hour away, and New York City is about a four-hour drive. There are 45 Nobel Laureates associated with Cornell, and a seemingly endless list of government officials, business leaders, artists, and engineers. In fact, 153 Cornellians have been elected to the National Academy of Engineering. Here are some of Cornell’s notable alumni. Ruth Bader Ginsberg – Ginsberg is an Associate Justice of the Supreme Court, appointed by President Clinton. She was the second female justice in history to sit on the High Court. She graduated with a BA in government from Cornell in 1954. Jeffrey Hawkins – The founder of Palm Computing and Handspring, where he developed the PalmPilot and the Treo, respectively. He received his bachelor degree in electrical engineering from Cornell in 1979. Tsai Ing-wen – Currently serving as the President of the Republic of China, commonly referred to as Taiwan. She is the first female president in the history of Taiwan, and the second Cornellian elected to the office (President Lee Teng-hui, who served from 1988 to 2000, was the first). Lewis Platt – Former chairman, president, and chief executive officer of Hewlett-Packard. He studied mechanical engineering at Cornell. Bill Nye – The Science Guy is a science educator, television personality, and mechanical engineer. He is also CEO of The Planetary Society. He studied mechanical engineering at Cornell. Toni Morrison – Though she is a Professor Emeritus at Princeton, this Pulitzer Prize and Nobel Prize-winning novelist attended Cornell, earning an MA in 1955. Columbia University is the fifth oldest institution of higher learning in the United States, founded in 1754 as King’s College by royal charter of King George II. The Ivy League school is also responsible for giving out the Pulitzer Prize. There are three undergraduate colleges at Columbia — The Fu Foundation School of Engineering and Applied Sciences (SEAS), the School of General Studies, and Columbia College — in addition to a number of graduate and professional schools. Tuition and fees for the 2016-2017 year came to $55,056, while room and board cost $13,244. Around 49 percent of full-time undergraduates receive need-based financial aid, and the average scholarship or grant is $47,490. U.S. News and World Report ranked Cornell #5 in National Universities, #6 in Best Value Schools, and #18 in Best Undergraduate Engineering Programs. The school came in at #19 in Times Higher Education’s World University Rankings. Columbia offers 16 engineering majors, 22 majors in the biological, natural and physical sciences, and over 60 majors in the humanities and social sciences. There are also 13 professional and graduate programs offered. Half of all undergraduates major in either engineering or science. At the Fu Foundation School of Engineering and Applied Sciences, engineering programs and courses are offered in applied physics, applied mathematics, biomedical, chemical, civil, computer engineering, computer science, electrical, environmental, financial engineering, industrial engineering, materials, mechanical and mining engineering. In 2015 and 2016, Columbia had an acceptance rate of 6 percent. There are 1,428 students in the class of 2020, with a 50/50 male-female split. 90 percent of the freshman class were in the top 10 percent of their high school class and 16 percent are first-generation college students. 43 percent of incoming Columbia Engineering students are women. Latinos and African Americans make up 15 and 13 percent of the class, respectively, and 28 percent are Asian/Asian American. A total of 69 countries are represented in the 2020 class. Columbia is located in the Upper West Side neighborhood of Washington Heights in New York City. The school has over 100 service and research partnerships across the city and students can get into over 30 museums for free with their student ID. 94 percent of students live on-campus, with the hustle and bustle of city life just outside their door. The school boasts over 500 student organizations and clubs, including political, religious, musical, dance, and academic groups. On the athletics side, Columbia has 31 NCAA Division I teams, over 45 club and 40+ intramural teams. There is also a tennis center, a boathouse, and a fitness center with over 5,000 square feet of exercise space — a real coup in New York City, where space is at a premium. Columbia has generated scores of notable alumni throughout its history, boasting five founding fathers, nine Supreme Court justices, 34 presidents and prime ministers (including four U.S. presidents), and 82 Nobel Prize winners including faculty. Here are a few highlights. Barack Obama – The 44th President of the United States majored in political science with a specialization in international relations, graduating with a B.A. in 1983. Warren Buffett – The investor and president of Berkshire Hathaway earned an M.S. in Economics from Columbia. Ursula K. Le Guin – LeGuin is a celebrated author of science fiction and fantasy. She earned her M.A. from Columbia in 1952. William Barclay Parsons – Received a bachelor’s degree from Columbia College in 1879, and a second from Columbia’s School of Mines in 1882. He also founded what is now the second-oldest continuously-operating daily college newspaper. Parsons engineered the New York City subway system, which opened in 1904. Paysa’s University Rank system found that Cornell graduates are among those who make $150,000 the fastest out of college. But how exactly does salary break down for graduates of these schools? How does the return on investment play out over the years? The average market salary for Cornell tech graduates with 0-2 years of experience is $142,000 per year, ranging from $72,200 to $183,000. Average market salary includes $98,300 base salary, $16,300 annual bonus, and $27,100 annual equity. The average market salary for Columbia tech graduates with 0-2 years of experience is $144,000 per year, ranging from $69,400 to $182,000. Average market salary includes $97,500 base salary, $18,000 annual bonus, and $29,000 annual equity. 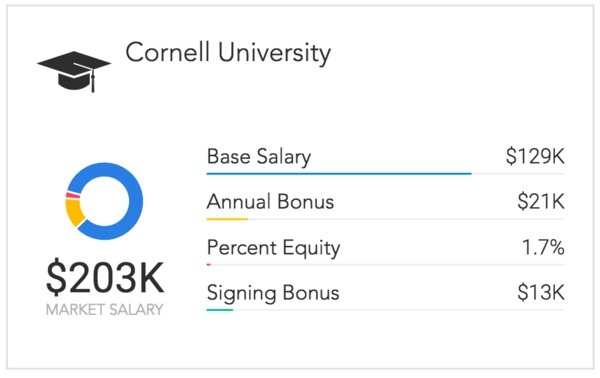 The average market salary for Cornell tech graduates with 2-5 years of experience is $180,000 per year, ranging from $84,900 to $238,000. Average market salary includes $111,000 base salary, $18,800 annual bonus and $49,800 annual equity. The average market salary for Columbia tech graduates with 2-5 years of experience is $180,000 per year, ranging from $79,200 to $232,000. Average market salary includes $110,000 base salary, $20,300 annual bonus, and $49,600 annual equity. 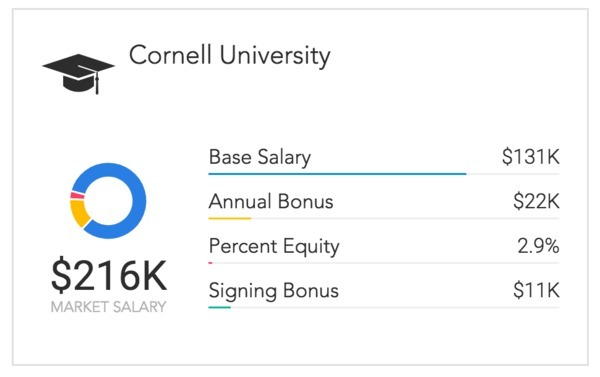 The average market salary for Cornell tech graduates with 5-10 years of experience is $194,000 per year, ranging from $94,200 to $246,000. Average market salary includes $122,000 base salary, $21,500 annual bonus, and $50,100 annual equity. The average market salary for Columbia tech graduates with 5-10 years of experience is $221,000 per year, ranging from $96,300 to $289,000. Average market salary includes $130,000 base salary, $23,600 annual bonus, and $67,100 annual equity. The average market salary for Cornell tech graduates with 10-20 years of experience is $216,000 per year, ranging from $91,400 to $279,000. Average market salary includes $131,000 base salary, $22,000 annual bonus, and $62,400 annual equity. The average market salary for Columbia tech graduates with 10-20 years of experience is $237,000 per year, ranging from $89,900 to $316,000. Average market salary includes $137,000 base salary, $23,200 annual bonus and $77,200 annual equity. The average market salary for Cornell tech graduates with 20+ years of experience is $203,000 per year, ranging from $94,300 to $263,000. Average market salary includes $129,000 base salary, $20,700 annual bonus and $53,400 annual equity. The average market salary for Columbia tech graduates with 20+ years of experience is $239,000 per year, ranging from $102,000 to $303,000. Average market salary includes $143,000 base salary, $23,100 annual bonus, and $73,100 annual equity. Columbia vs. Cornell: Which Tech Grads Make the Most? And the winner is… Columbia! Aside from the 2-5 year bracket, where graduates from each school earn the same average salary of $180,000, Paysa data shows that Columbia graduates consistently make more money on average than Cornell graduates. Though other factors will certainly go into your choice of school, the return on your investment is an important one. Either way, the outlook for your future tech salary is a good one. Paysa works to empower people with the information they need to get paid what they deserve. We serve up thousands of new data points each day so that you can make informed decisions about your salary requirements. Sign up today to personalize Paysa for you.